IBM® Service Management Suite for z/OS provides operators a transparent view of the IBM z Systems® compute landscape, including central electronic complexes (CECs), LPARs, and Sysplexes with key performance indicators for improved problem isolation, analysis, and diagnosis. 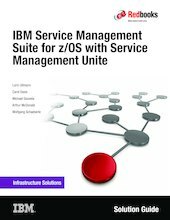 This IBM Redbooks® Solution Guide describes Service Management Suite for z/OS and its new user interface, IBM Service Management Unite, and includes high-level architectures (for each solution) with their key components. The guide also explains the integration of Service Management Unite with Service Management Suite for z/OS components and integration with other IBM products and third-party solutions to create a comprehensive solution. The business value and usage scenarios are also included.